Detectives are appealing for further witnesses following a serious assault in Margate. Officers were called to a disturbance in Marine Gardens at 1.28am yesterday (January 1). On arrival witnesses reported an assault had taken place nearby and two people, a man aged 27 and woman aged 29, were arrested. The victim, in his 20s, had already left the area when police arrived. He was discovered at a local hospital receiving treatment for knife injuries. The man told officers he was assaulted whilst walking along an alleyway near to Marine Gardens and Albert Terrace. The incident, originally tweeted by Thanet Police as having taken place at Kabuki, was not connected to the Margate club. A Margate man who says he was injured in the attack has asked not to be named. He said his friend was also stabbed. The photos show injuries suffered. He said: “I am in a lot of pain. A woman threatened a girl and her boyfriend pulled a knife. I ran at him trying to get the knife off him but I got pulled off. He then stabbed my mate and ran down the alleyway. The second man injured says he was cut on the arm and face and had stitches. Enquiries are ongoing to establish the full circumstances of this incident. Anyone with new information that could assist with the investigation is urged to call 01843 222289 quoting reference 01-210 as soon as possible. The man arrested from Margate has been released on bail until Monday 21 January. The woman, from Gillingham, has been released pending further investigation. It’s disgusting people, men and women are going around involved with knives and using them on others. They need locking away from the public. Also, not making the news. A staffie dog was stabbed and mortally wounded in the communal corridor at flats near Jackey Bakers on New Years Eve by a neighbour with a jack russell. The staffie received emergency treatment at Pets At Home but had to be put to sleep the next morning at PDSA. Police did not arrest the culprit, not even for having a weapon on him. Knives seem to be normalised these days. The staffie involved was not on a lead at the time having escaped out of his flat on a lower level and was attacking the guys jack russell which was on a lead, having just come back from a walk, in the jack russells owners home in front of both the owners wife and young daughter. 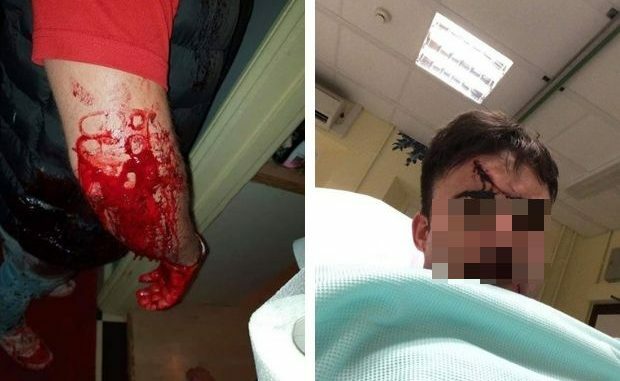 The jack russells owner tried all he could to get the staffie off his dog and ended up quite bad cuts on his hands from trying to pries the staffies mouth open. Using a knife was possibly not the best thing to do, tragically for the staffie, but the jack russell owner must have thought at the time, after trying with no results for over 10 minutes, that he had no other option. The police were called whilst the attack was happening and 2 officers attended shortly after it ended and did caution the jack russell owner but must have decided to not take any further action so far. The staffie was rushed off to the emergency vets shortly before the police arrived. Its a tragic event but you cant place all the blame onto the jack russells owner. Thought it had to be something like that-cannot really envision somebody stabbing a dog to death for no reason & the police & RSPCA doing nothing. Actually I think the guy showed incredible restraint waiting for 10 minutes. You cannot put any of the blame onto the guy who did it, all the blame goes on the pathetic excuse of an owner-can just imagine what the owner looks like.